restoration system for shoreline stabalization on lakes ponds and canals. With each heavy rain that falls in Florida, stormwater rushes through ditches and into a small river surrounded by densely populated communities. So much water flows from the urban areas into the canals and Rivers that a one-inch rainfall can raise river water levels by four feet or more. and lake banks and filling in the bottom. The buildup of sediments in some areas has caused flooding in the surrounding residential communities, and has deteriorated water quality in the waterways of the federally-recognized canal systems. As the population of Florida Georgia and Texas easpecially communities in Orange and Seminole counties has more than doubled in the past 30 years to 1.2 million, the volume and rate of stormwater flowing into the Little Wekiva River has also grown. Much of the development within the Little Wekiva’s basin occurred before stormwater regulations were put in place, leaving only minimal stormwater storage and treatment upstream of the Little Wekiva River. Concerns for property damage caused by erosion in HOA's and Golf courses with adverse environmental and water quality impacts from the movement and settling of sediments, have led us to play a vital role in assisting public with shoreline restoration. So much water flows from urban areas into the lakes and ponds that a one-inch rainfall can raise water levels by four feet or more. SHORELINE EROSION is the continual movement and relocation of soil particles caused by wave action. Our shoreline Specialists, serving the South East, have one main focus in mind, and that is to prevent shoreline water and soil erosion using a variety of methods. Several factors play into the design of any particular erosion solution. Wave size area must be considered first. Next the the impact on the surrounding areas. In addition, the slope at which the restores soil area are placed against the bank is extremely important. If any of these factors are overlooked, the erosion control method may run into surprises. Our Shoreline Specialists take pride in designing and implementing long term erosion control features for property owners on Lakes and on any Florida waterway. It is our opinion, based on fact and science, that shoreline erosion can be prevented and controlled without disrupting the bank with heavy equipment and is maintenance free for years. Our Shoreline Specialists, can provide erosion control get back a huge amount of the home owner's property. Contact us for your erosion control solutions. Geotextiles are special synthetic fabrics manufactured in a woven or non-woven manner to form blanket-like products with the benefit of being permeable to water and rot-proof. Geotextiles have a number of uses primarily in civil engineering such as with road construction or erosion control. 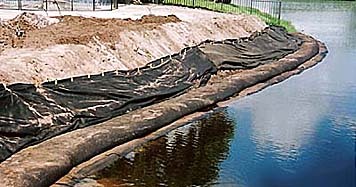 Geotextiles also can be used for horticultural projects for prevention of weed growth or as a filter layer. Whatever your need, let us help you determine the product for you! While work on the immediate needs caused by the erosion are being addressed, efforts are also under way to plan solutions to address the excess stormwater being channeled into the river. Amaerican Shoreline Restoratin is planned to begin on several projects in early 2010, with design work to begin on many more projects later in the year. With the support of Florida's water management district allowing our team to move forward with the design and construction of even more projects for the near future, stepping closer to improving many areas of the Florida watershed.